When I speak with customers about their journey to modernize finance, I have noticed that while many finance executives know where they want to get to, they are struggling to get started. In a previous post (The value of modernizing finance for CFOs), I suggested guidelines for creating a road map that can be used once the decision to modernize has been made. This post will focus on the preparation needed to take that first step. As you begin to compile the business case for modernization, following are important questions to consider – all of which have enterprise-wide impact. In addition to bringing your own suggestions to the table, you’ll also want to encourage collaboration with other stakeholders as you work through the answers. How can we create a single data point model for financial close, financial planning & analysis and performance management to cover all information needs for overall company strategy, business partnerships, and compliance? How can we unify all process steps in the planning and control cycle? How to onboard people, change the culture, and train people to improve their digital and analytical skills and facilitate our move to modernization? How do we implement data stewardship across the organization once an information-centric data hub is implemented? It’s important to recognize that the implementation of a new unified software platform can be a catalyst for positive change and increased business agility. These are important benefits to emphasize throughout your modernization journey. But, in order to succeed, finance will need to work with stakeholders across the enterprise to identify information to be captured, document process dependencies, brainstorm on any new necessary processes, and determine what new training might be needed to the new system and any related process changes. Once you’ve drafted your road map and addressed the above fundamentals, you’ll need to seek the endorsement of top management for your modernization initiative. Obviously, in order to get this sponsorship, you must ensure senior leaders have a clear understanding of your goals, your proposed roadmap, any potential challenges, and the benefits to be gained. The CIO and IT organizations need to be onboard with your modernization vision, as well. Ideally, your plan will be based on a unified new platform that does not disrupt the current IT-landscape when implemented and will easily fit into current procedures for system and data governance. When having conversations with IT, I recommend emphasizing the IT-related efficiencies that will result from modernizing finance – such as dramatically reduced data redundancy, fewer hardware resources, and streamlined data storage. For instance, today, with upcoming in-memory database technologies such as SAP HANA*, the number of data storage layers can be reduced and that is good news for both IT and finance. A single set of numbers from one source improves confidence in the data for financial and business users. Such technologies also lighten the IT burden by reducing the number of systems and databases to be integrated and maintained – resulting in a lower total cost of ownership that should incorporated into the business case for modernization. As you interact with stakeholders throughout the enterprise to get the buy-in needed to begin your modernization journey, be sure to communicate – frequently – that the results of this initiative will bring benefits to all. 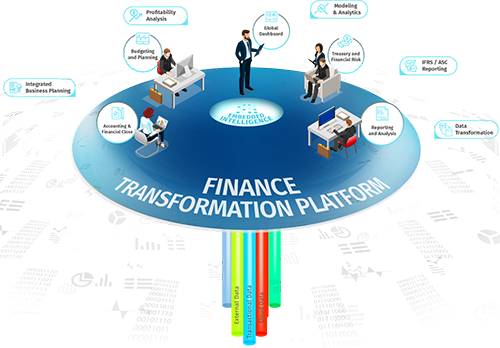 Certainly, finance modernization will make life easier and simpler for you and your team, but it will also result in more detailed insights, better and faster decisions, and streamlined processes for all stakeholders. What are you waiting for? *CCH Tagetik natively integrates with SAP HANA, a leading in-memory database platform. SAP HANA unifies relational and OLAP technology to reduce latency and improve performance of intensive data-processing tasks such as waterfall allocations, simulations, granular analytics and consolidation. Moreover, SAP HANA provides an extensive library of functions for predictive analytics, artificial intelligence and machine learning. Multiple customers are now using CCH Tagetik on SAP HANA and realizing spectacular performance gains for operational planning and consolidation.